Version 1.80 introduces small changes to make things easier for you. The login screen now has a Help Manual button that displays our always current on-line documentation. The documentation guides you through both using and configuring your POS. The payment screen now has larger tender buttons and a larger tender type displayed on the amount confirmation screen ensuring that payments are always applied correctly. 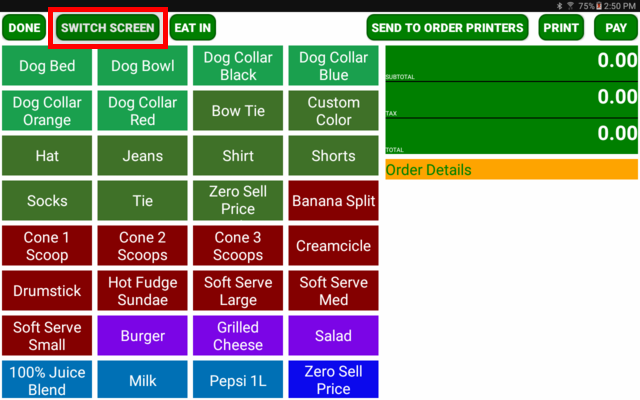 For clients using the fast order screen you may now switch to the regular order details screen using the Switch Screen button. This is ideal if your fast order screen has a subset of your products and an order starts off as fast but changes to include additional products not available on the fast screen. Version 1.80 also includes changes for new hardware that will be announced soon. Watch for upcoming announcements.